Changing to a h2 - h3 hierarchy looks kind of wonky since the h3 is code, and it heads a single-line explanation. After — in this pull request — we have an h2 with a definition list. Note I added a p tag on the dd elements to get a better looking bottom margin between dt elements in the list. 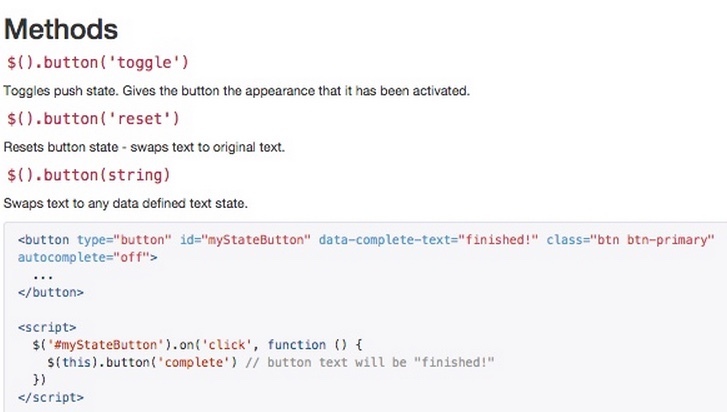 We'd probably want the same styles on all our code headings then, no? We have those in a lot of places. I count 29 other instances, yes. If you prefer code in definition lists rather than headings (my guess: yes) then I'm on it. OK I hit all 29 instances. The general case has more text than buttons.html so I reverted buttons.html back to using h4 tags. Starting now all h4 tags have code tags where appropriate. Here's what it looks like now, using modal.html here as an example. @mdo You down with this? Slightly larger for you. I think this looks really good. As a result of #15946 there are other instances in documentation where we have in-line code in headings. Fixed. 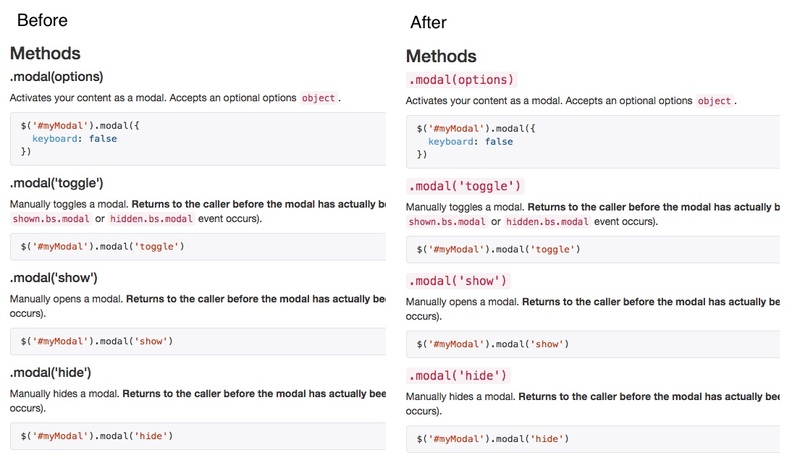 The CSS commit above covers some instances of code-in-headings not seen in the components section of the docs. 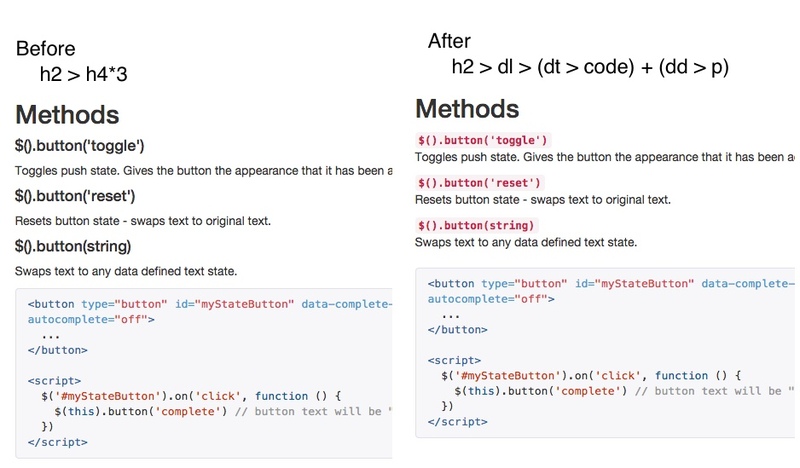 Here's a before-and-after look at code in larger headings. This is code in-line with other heading text. Note: in-line code in headings inherit the heading background color. I am very much in favor of using <code> for method headings in the API docs like this. @StevenBlack: can you fetch and rebase? It's inline and not in-line as far as I can tell. Also, break one selector per line. @XhmikosR Confirming: in-line is correct usage. I'd rather have it inline. @StevenBlack: Also squash the patches and take care of my previous comment please. "inline", and one line per selector. You'll be presented with a list of commits that say pick [something] "commit message". Looks like the rebase had some problems. I'm happy to do the squashing when merging this. Just waiting on @mdo to approve the style changes. upstream/master after you have fetched upstream. And we do this busy-work because....? Just curious. Ah. Sorry @XhmikosR I've had bad luck doing it that way. As long as it works though in the end that's what matters. But yeah, @StevenBlack having a single commit to point to for a patch, in my opinion, can make it easier to identify where a regression or bug was introduced and trace it back to the correct issue so you don't have 15+ commits for a single patch.